The "Did Balrogs have wings?" debate has reached legendary (and to outsiders often comical) proportions. The books are ambiguous on the matter, but the movies follow the interpretation that they did have "wings of shadow". Could they fly? Did they even need wings to fly? Could they have had skeletal wings yet still be flightless? Discussion has occurred as to whether the Balrogs had wings. Nothing has been decided conclusively, although the Balrog in the Peter Jackson film version of The Fellowship of the Ring(2001) was clearly winged, and did not fly. The debate mainly comes from The Bridge of Khazad-dûm, a chapter in The Fellowship of the Ring. There are two references in this chapter. 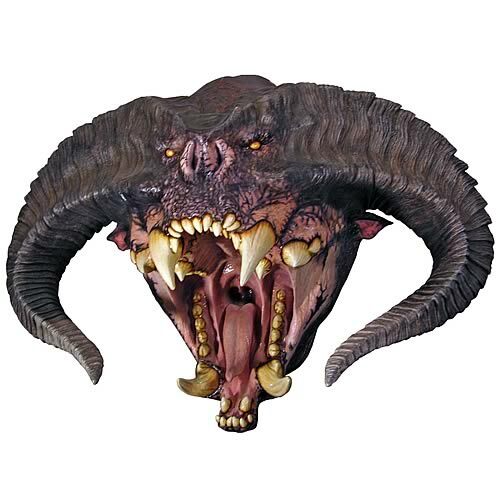 A Balrog in The Lord of the Rings films. —The Lord of the Rings, II:5, "The Bridge of Khazad-dûm"
Readers usually make their own interpretations about this and feel it to be quite obvious. However, this can be seen in three possible ways. Some people think the Balrog, has wings, and can fly, yet it did not because it was in too narrow a space. For others, the Balrog has a shadow-like emanation, that assumes a winglike shape. Later, this winglike shadow is spread from wall to wall. But some, however, think that the Balrog has actual wings that are spread from wall to wall. There is no real conclusion to the debate and it will probably continue as long as Tolkien has readers. At first, Peter Jackson and his design team couldn't decide whether to give the Balrog wings or not. They ultimately decided to give it wings "just because it looked cool." Here, the Balrogs are said to travel "with winged speed" and arrive in "Lammoth as a tempest of fire". This may be taken as a metaphor or as evidence for flying, or at least that Balrogs could augment their bipedal speed with beats of ruined, skeletal, flightless "wings". The first reference to the Balrog is one of the main arguments against wings, as it explicitly refers to the balrog's actual form as being "of man-shape, maybe, but greater;" and clearly, men do not have wings, and thus no mention is made of them. Furthermore, this man-shaped dark form was at the middle of a shadow-like area around it; this is introduced in simile, as "like a shadow", i.e., "shadow-like," but only an area of darkness, where the light of the fires in the hall were dimmed by some dark power of the Balrog. Hence no wings are described, just the area of shadow around its body. Likewise, the first mention of "wings" is made in simile, and refers to the shadow, rather than its body: "the shadow about it reached out like two vast wings." Here, the simile refers to "wings of shadow" instead of physical wings. However, "wings of shadow" are still wings in the same sense that anything wing-shaped is a wing, wings of a building for instance, but not birdlike or bat-like wings. Another common argument is that Balrogs are never exactly described as flying, as might have been expected had they wings, and the Balrog of Moria could have saved or helped itself by flying when Gandalf smote the bridge and made the Balrog fall into the chasm, but didn't do so. —Quenta Silmarillion, 23 "Of Tuor and the Fall of Gondolin"
—The Lord of the Rings, III 5, "The White Rider"
The argument concerning the passages above is that those passages seem to imply that the deaths of the balrogs (and of Glorfindel) resulted from the fall, and if balrogs had wings capable of flight they would have used their wings to save themselves. In The Hobbit, when Bard the Bowman slew Smaug the Golden, the dragon (who certainly had wings) fell from a great height and smote the Laketown in his ruin, and Ancalagon the Black, the father of flying dragons, also fell to his death "in ruin", but that was after they had been killed. Some arguments draw upon passages that Tolkien rejected or replaced. These arguments are disputed as being irrelevant to the published text in The Lord of the Rings (which is the source of the controversy). As for the quote from the Silmarillion, the Balrogs may have simply run very quickly on foot, despite being bipedal. Tulkas, for example, was in humanoid (i.e. bipedal) form, but still could "run faster than all things that travel on foot," and therefore it is possible for bipedal Ainur-creatures to travel "with winged speed" as well. Another argument is that if Balrogs were capable of flying like dragons, they are certainly never seen to attack from the air, even when it would be most useful; for example in the battle of Zirakzigil, the Balrog would have benefited greatly from taking the to the air and striking Gandalf with its whip or other spells, or could have just flown away to escape (he had earlier fled from Gandalf, who pursued him to Zirakzigil). Indeed, Morgoth spent many ages breeding the winged dragons in order to attack from the air; but never once does any Balrog do so, even in the attack on Gondolin. Finally, it is possible that, due to their being Maiar, the Balrogs could choose whether to have wings or not, and they needn't necessarily have looked or been physically the same. But since all Balrogs chose their form to be massive, so as best to serve Melkor in combat, even those Balrogs that elected to have wing-like appendages almost certainly could not properly fly. The original description of a Balrog is a "corrupted Maiar", and only Durin's Bane is specifically described as having wings of shadow.